At Integra, Destructive Physical Analysis (DPA) is performed to evaluate the quality of construction of electronic devices normally performed per lot date code in order to verify that the quality meets the specified requirements. Our broad background in device construction techniques and device failure mechanisms provides us with the extra insight required to make good technical judgments on the use of a lot of devices. This extends into the Plastic Encapsulated Microelectronic (PEM) DPA's where good jet etch decapsulation techniques are required to prevent damaging the part. Destructive Physical Analysis (DPA) This rigorous process of sample testing is done to specification ensuring a high reliability component or device is fabricated to the required standards. 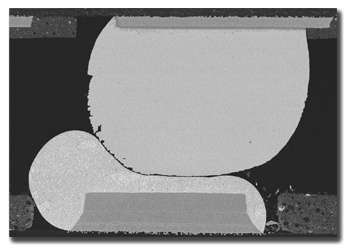 Key steps in this process include External visual inspection, X-radiography, Delidding, Internal and SEM inspection, Energy Dispersive X-Ray Analysis (EDS), bond pull and die shear testing.